The Nageswara temple at Kumbakonam is dedicated to Lord Shiva. He is seen here in the form of Nageswara, the serpent king. 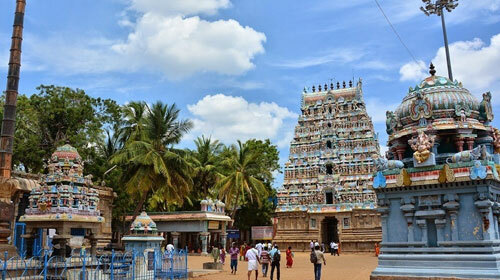 This temple is the one among the Shiva temples located along the banks of the Cauvery river. The temple was constructed by Aditya Cholan during the 9th century and is a standing example of the Chola architectural and sculptural marvel. The temple is constructed in such a way that the Sun’s rays fall on the presiding deity during the Tamil month of Chithirai (April – May). Legend has it that when the serpent king, Adisesha was feeling the weight of the earth over him, he prayed to goddess Parvathy who granted him strength at Kuvivanam. The water tank in this temple is known as Naga Theertham. Also another legend has that the serpents Kaarkotakan and Dakshan worshipped Lord Shiva at this place. The temple is open from 6.00 am to 12.30 pm and between 4.30 pm to 9.00 pm. During the festival of Theerthavari the Lord visits the Mahamaham tank which is a very special day in this temple. other festivals celebrated in this temple includes the Panguni Peru Vizha, Navarathiri and Thiruvadhirai.